'It's a Question of Logistics.' How Goodr is Tackling Hunger in the U.S.
‘It’s a Question of Logistics.’ How this Company Is Tackling Hunger in the U.S. There is enough food in the world to feed everyone, yet in America alone, 42 million people do not know where their next meal is coming from. In this episode of Mastering Innovation on SiriusXM Channel 132, Business Radio Powered by The Wharton School, Jasmine Crowe, Founder and CEO of Goodr, discusses the origins of her business, the new technologies and policies that have enabled Goodr to develop, and the win-win situation for everyone involved. Every year, 40% of the food produced in this country is thrown out. Rather than donate to those in need, most businesses dispose of excess food. After starting a sit-down dinner series for Atlanta’s homeless community in 2013, Crowe, who cooked all the food herself, questioned why restaurants weren’t able to supply their surplus food instead. In the beginning of 2017, Crowe launched Goodr to provide a service that would do just that. Utilizing the sharing economy like Uber or GrubHub, Goodr allows businesses to receive millions in tax benefits, reduce their carbon emissions from landfills, and get food to local communities in need. Nicolaj Siggelkow: Goodr sounds like a wonderful idea because you’re solving multiple problems at the same time and creating value throughout the chain. Tell us a little bit about the key suppliers or your providers of food. I’ve read that one is the Atlanta Airport. What are some other big providers of food for you? Jasmine Crowe: The Atlanta Airport is the big one. We also work with the Georgia World Congress Center, which is the third largest convention center in the country. We have Turner Broadcasting systems and Pivotal Software. We’re beginning to expand our relationship and bring on additional businesses. We’re launching in other cities that include Chicago, Raleigh, North Carolina with MetLife, Chick-fil-A. We’re continuing to grow and looking for more companies to join us. Siggelkow: On the other side, what are the charities that you’re working with, because you’re not distributing the food yourself, right? You’re working with others who have that distribution setup. Crowe: We set up the distribution; we distribute the foods. Nonprofits can register on our website for free and then we get food delivered to them based on the hours when they can receive food. Right now, we have over 4,000 nonprofits that are registered with us across the United States. Unfortunately, we’re not in every single city and state where we have nonprofits. We now have higher needs than we have supplies, so we’re trying to get real businesses to see the business case in what we’re doing, but also see that this is the right thing to do, that it’s time for them to stop throwing away this food. The liabilities, that whole “We’re going to get sued” fear — that’s been taken care of. Goodr handles that; we absorb that for you. We’re giving businesses no excuse not to do the right thing. We just have to continue to educate more companies on this need and how they can change. Siggelkow: Sorry, when I said distribution, I meant to the people who actually need the food. You are bringing it to the not-for-profits and through them distributing the food. Is that correct? Crowe: It is. In addition to that, we also work with a lot of senior homes and afterschool programs, and we get food directly to them. We have a lot of groups that we work with. Siggelkow: That’s wonderful. Thinking about creating a new company or a new organization as you did, there are always these choices that you have to make. How many things do you want to do yourself, and where do you use partners? Like you said, for instance, you’re using a third party logistics company. Crowe: Yes, we’re looking at a circular economy. We look at companies that are moving food into grocery stores and into restaurants. When that truck leaves, it leaves empty. Now we’re looking at how we can fill that truck up with surplus items to get to people in need. We look at it as a holistic change that we’re trying to create. Crowe: Exactly, that’s our mantra. Siggelkow: That is such a cool insight of saying, “Look, we have so much surplus…” Maybe you can give our listeners a little bit of data here on both sides of the equation. Those numbers are rather staggering, both on the sides of how many people are actually hungry, and how much food we are throwing away. Crowe: We have about 42 million people that are living with food insecurity in this country every year. What that breaks down to on a more granular level is about one in six people that are going to go to bed hungry tonight and will wake up tomorrow not knowing when or where that next meal is coming from. About 13 million children and 7 million seniors are in that number, accounting for more than half of our hunger population. At the same time, we waste about 40% of everything that we produce in this country, and that’s about 72 billion pounds of perfectly good food that goes to waste. This doesn’t include the waste that happens in our households, the things that you and I would throw away in our kitchen. Siggelkow: That’s really amazing. People probably knew some of these facts earlier. The interesting question is, why now? Would Goodr have been possible 20 years ago? What sort of technological innovations have enabled Goodr to come about? Besides your brilliant idea of doing it, of course. Crowe: Obviously the PATH Act, which is a new tax legislation that actually allows businesses to write off up to 30% of their annual income in food donations. That’s a good piece of it. The Bill Emerson Good Samaritan Act has been around since 1996, but we still have to continue to educate people on the fact that this is legal, that they are not going to be held liable. Then I think technology is a factor. This was high time. We are testing cars that drive themselves or letting people pick us up at our houses where we sleep with our children and our grandparents. We’re not afraid of that, but this whole time we’ve been afraid of doing the right thing as it relates to fighting hunger. Maybe 20 years ago, when I was a young teenager, this wouldn’t have happened. I wouldn’t have been able to lead the change then. What I’ve focused on now is saying to anybody and everybody who will listen that businesses wasting food is wrong. There is no excuse anymore. They get tax credits, there are incentives, there’s no liability. These businesses have to start doing the right thing because we have far too many people that are still going to bed hungry. Compassionate, Zealous, Visionary and Inspiring are just a few of the words that describe Jasmine Crowe, an HBCU alumna who is working to make the world a better place. 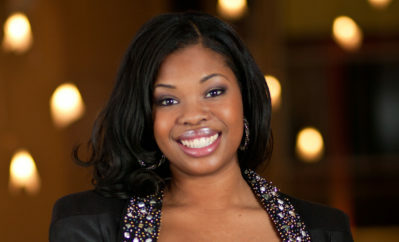 Deeply rooted in service Jasmine launched her first company BCG in 2011. Thru BCG she partnered with celebrities across the nation in a host of cause campaigns to ensure their star-power was being used for good. Lead by Jasmine, BCG hosted activations in more than 20 US cities and the UK, South Africa and Haiti and has collected and donated over three million items to causes worldwide and fed over 80,000 people through the Sunday Soul Homeless feeding initiative. Jasmine also served as the creator and executive producer of Change Makers a half hour docu-series profiling how celebrities use their star power for social change which premiered on Magic Johnson’s network ASPIRE! In January of 2017, she launched Goodr, a sustainable food surplus management company that leverages technology to combat hunger and reduce waste. Today Goodr redirects surplus food from convention centers, airports, and businesses to people who are food insecure. Under Jasmine’s direction the company now has clients that include: Turner Broadcasting Systems, Hartsfield- Jackson International Airport, the Georgia World Congress Center and more.